Jubeat Saucer Music Arcade Machine is a music game where players must correctly hit the panels that match appears on the screen. Jubeat Saucer Music Arcade Machine is an arcade music video game developed by Konami Computer Entertainment Japan, and is a part of Konami's Bemani line of music video games. The cabinet utilizes a total of 17 screens, with 16 of them arranged in a 4 x 4 grid used to play the game. Jubeat Saucer Music Arcade Machine is an arcade music video game developed by Konami Computer Entertainment Japan, and is a part of Konami's Bemani line of music video games. The cabinet utilizes a total of 17 screens, with 16 of them arranged in a 4 x 4 grid used to play the game. • First jubeat game since the original jubeat to have BEMANI crossovers. • First jubeat game to remove old Konami original songs. 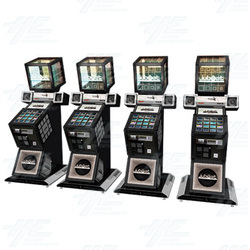 • First jubeat game to have a "splash" animation display on the screen when a FULL COMBO is achieved, similar to beatmania IIDX and DanceDanceRevolution X2/X3. • First jubeat game to not include a new classical piece arrangement by Mutsuhiko Izumi. • The unlock system of jubeat saucer is called bistro saucer. You'll collect ingredients and make dishes to feed gourmets. • Previously locked songs can now also be unlocked via bistro saucer, in addition to playing FULL COMBO challenges and matching against someone who has that song. • jubeat saucer will refresh its song list each month by swapping existing songs with 15 to 20 new ones. These songs can be licenses, BEMANI crossovers, revivals, or entirely new songs. PLEASE NOTE: This machine is an online only machine. This means you must have a paid subscription to the Konami online server to operate the machine. We are unable to help with this subscription.